Spring Rally “Springstock” is this Sunday, March 24th! Annual Spring Rally – is this Sunday, March 24th! Mount Peter, New York’s family mountain, is gearing up for its annual spring rally, which will take place on Sunday, March 24. This year, Mount Peter has themed its popular event as “Springstock,” a nod to the 50th anniversary of the Woodstock festival, which took place not too far away, in the Catskills town of Bethel. Springstock attendees are encouraged to dress in era-specific styles, from hippies in headbands to beatniks in shades or their favorite Yasgur farm rock icon. The Springstock schedule includes something for everyone, no matter whether they choose to participate or spectate. The Obstacle Course, a perennial favorite, is back to challenge children ages five to 10. Other options for the kids include a Bouncy House, and tattoo station where kids can have their faces decorated – maybe even with some flower power symbols. Max the Magician will also be putting on a show to add some abra cadabra to the festivities. For those competitively-spirited visitors in the crowd, Mount Peter is bringing three of its classic contests. A ski jump made just for the day will host the Big Air Contest. Two age groups, 5-14 and 15 and up, will be judged on style, execution and landing. The Rail Jam Contest is open to contestants 14 and under and 15 and up who will attempt to hit some features set up just for this contest. 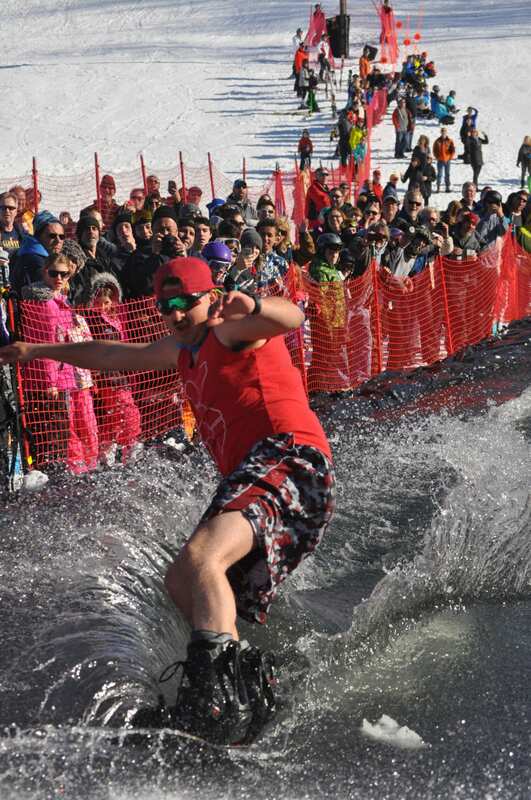 And, the Wacky Waterski Contest challenges skiers and snowboarders 18 years old and up, to skim across the surface a man-made pond – more than 50 feet of icy water. Of course, that Cardboard Race is also back. In this all-ages event, whole families and other teams come together to craft a rideable sled out of cardboard and captain it down the mountain course. Cardboard race rules, including acceptable materials, are posted here! There will be snacks available throughout the day in the lodge, and an Outdoor Bar & Grill will be open. DJ Jay Bird will also be spinning tunes, and there will be live music performed by local band, Whiskey Riot. Please note that signatures will be required for all competitive participants, including parental signatures for younger visitors. No Reservations are needed, but a Lift Ticket/Area Pass is required for mountain events.